As a four-day conference in Nigeria to discuss the state of African fishing draws to an end, BBC News looks at how over-fishing and limited investment is hitting traditional fishermen in Senegal. In the Senegalese village of Yoff, just a few kilometres up the coast from the capital Dakar, the hundreds of canoes lined up along the seaside tell the whole story. Despite growing urbanisation, fishing by traditional methods remains a vital occupation, a key part of the country's economy - and just as important, a way of life. Artisanal, or traditional, fishing produces more than 300,000 tonnes of fish a year. For many villages along the coastal area, fishing is the only economic activity to provide decent jobs and continues therefore to attract people looking for a decent living. And for the nation as a whole, this traditional form of fishing contributes a lot to ensuring food security. Combined with the industrial fisheries, it also provides the country with the much-needed foreign currency and contributes immensely to its balance of trade. But this sector is now threatened, not only by the competition of the huge boats of the industrial sector, both local and international, but also by its own unregulated development and practices. 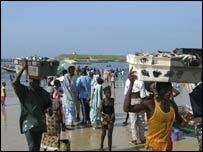 Yoff is mostly inhabited by the Lebou community. Here the main human activity has been for centuries centered around fishing. And residents are fishermen from father to son. Next to the lined-up canoes, amidst the crowd of traders, fishermen, and curious children, are a few lorries. Young and robust men are busy loading boxes of fish freshly taken from the sea in one of the canoes which has just landed to the coast. Abdoulaye Lo has been fishing for 20 years. He always spends one night one at sea and comes back the next day. "This time of the year is too bad," he says. "It rains too much and the sea is rough." But his major complaint is the unfair competition from huge boats, and the ever-growing scarcity of the sea resources. Shrimps, for example, are nowhere to be found these days, he says. 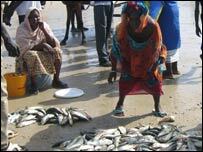 Ndiawar Gueye is another senior fisherman. He owns four boats and teaches fishing to his younger siblings and his children. He claims to be a master fisherman - and is visibly given due respect by those found working with him. For him, the main issue is the ban on certain type of nets and fishing methods, which he says seriously jeopardizes Yoff's source of income. "It has become so difficult to earn even 100,000 CFA francs ($190; £100) a month" after all these nights of hard work at sea, he says. The fishermen's complaints are echoed by the traders. Diarra Seck, president of a women traders' association in Yoff, fears the lives of people in her community are deteriorating. "The big boats come almost to our shores, after the night prayer we can see their lights from the coast," she says. "We have raised the issue several times, but the problem remains unsolved. We really need help on that." The only activity they know in Yoff, she says, is fishing. "Yoff is a village of fishermen. We are so desperate now - the sea is not providing anything anymore," she complains. "We, the women can't get any income, we are almost wasting our time. The months of May, June, July used to be fruitful, but this year, we have seen nothing." Yoff's plight is replicated up and down the Senegalese coast, with the potential to affect as many as a million people employed directly or indirectly in the fishing industry. 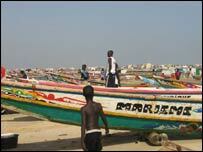 The several hundred canoes fishing out of Yoff form part of a flotilla of about 12,000 in all, according to Moustapha Thiam, deputy director at Senegal's Office of Maritime Fishing. The government is trying to introduce new reforms to the sector of artisanal fishing for its survival and sustainability, he says. "So far, this has been a free sector, where no one pays taxes and no permit is required," he explains. But now the government is trying to find ways of restricting the ever-growing canoe fleet - "in consultation with the organization of fishermen", he insists. Although the government's plans have yet to be made public, Mr Thiam says they should help protect against the current over-exploitation of maritime resources - and thus try to protect the 160bn CFA francs the industry brings in through exports each year.